This home run, Cody Bellinger’s seventh of the season, happened last night, but it’s a highlight worth replaying over and over again, if only because the audio is so satisfying. If you want to talk about the crack of the bat, one of the best sports sounds, this is a crack of the bat. No, this is a bat yelling “CRACK” into 75 lined-up megaphones. The Dodgers outfielder bashed this homer in the dregs of Sunday’s 12-6 victory in Denver. 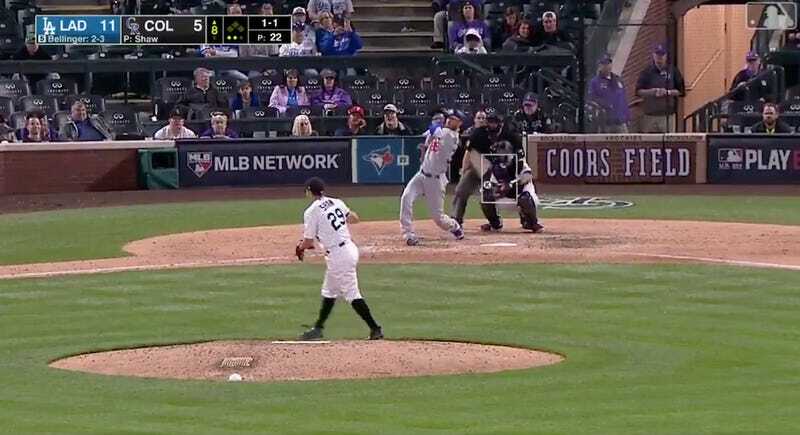 Rockies reliever Bryan Shaw, who hadn’t given up a run in five appearances this season, left that pitch in what is scientifically referred to as the Juicy Zone. Bellinger provided a service when he deposited this ball into the second, because anyone caught taking a little nap at the ballpark was almost certainly woken up by that firecracker. Hot damn! Although, upon carefully reviewing the video, it felt like Bellinger smushed that dumb little sucker a bajillion miles per hour, Statcast says the actual exit velocity on this homer was 106.6 mph, which doesn’t even rank that high for this season’s dongs. Whatever, you can’t take this away from me. Bellinger and the Dodgers can’t help themselves: They refuse to stop dingering. No complaints here.